Comparing the work of several horses over the same work can measure its state of preparation and allow the comparison of physical capabilities including speed, heart rate, stride and stride length. The morning exercise is a 1000 meter gallop on an all weather track at a training centre in Australia. The trainer has instructed the lads to maintain a speed of around 50 km per hour over the gallop. There are 3 parts to the training regime: Warm-up at trot, 1600 meters of gallop with 1000 meters at 50 km per hour and then an active recovery trot. – Graphics – speed, heart rate, stride frequency and stride length. The information relating to strides are measured at the trot and canter/gallop. – Interval information measured every 200 metres (furlong): Time, average speed, average heart rate, gradient of the ground, average stride length and frequency. The second graph which monitors heart rate, indicates that the horse is very calm as he exits his stable (40 beats per minute), this remains stable until he arrives on the gallops, we can see that his heart rate then begins to climb. Once on the gallops and warming up, we can see that the speed during this phase is completely regular. Looking at the second graph, heart rate, we can see that the horse remains calm during the warm-up with only a slight increase at the beginning of the trot and then reduces during the entirety of this part of the training session. Looking at locomotion parameters, graphs 3 and 4 which provides data on stride length and stride frequency, it is very obvious that this horse has very regular patterns. These are all positive points prior to the work. The trainer has asked for a specific piece of work over the gallop phase and the lad has done his job ensuring that the horse can start the concentrated exercise in the best condition possible. During tis phase, the first graph allows us to see precisely the speed. After a peak at 52 km per hour before the first turn, the speed is then constant around 50km per hour during the 1000 metres, following exactly, the trainer’s instructions. It is particularly interesting to observe the heart rate curve throughout Horse 1’s session. We can see that it is progressive, never reaching a high level and we can see the decrease even before the end of the phase, a sign that the horse has not been over exerted. If we look at the heart rate stabilisation, we look at the descent of the heart rate curve, which is between the peak of the speed exertion and the descent of the curve after the gallop. The heart rate stabilises at 93 beats per minute. This is relatively low, confirming that the exercise was well within the capacity of the horse, was not too intense and that the horse is fit. As we progress through the re-running of the training, we see on the graphs for stride frequency and length more data after the gallop. This corresponds to the recovery trot. Before the trot the heart rate is at 94 beats per minute and then stabilises at 76 beats per minute. The reduction in beats per minute during active recovery, show the trainer that the horse has recovered well from the exercise and is now ready to return to his box. If we look to the end of the heart rate curve, his heart rate is at 65 beats per minute. With this type of exercise, it is interesting to compare the speed of the horse. At 50 Km per hour, if we hold the cursor on the graphics we can freeze at a specific moment in time. We can see at 50 Km per hour that the horse is covering 5.9 metres at a rate of 2.3 strides per second. These type of reading are often synonymous with the ability to maintain speed over a long distance. Finally, the interval table graphically represents the horse’s progress through the entire training session. We can choose the distance but if we choose 200 metres (a furlong) we can easily compare the horse’s vitals. We can clearly see the time it took to cover the 200 metres, the average speed, heart rate, the altitude of the ground which allows us to understand the effort expended as well as average stride length and the rhythm (frequency of strides). This horse has never run a race. The general data from the training will be very similar, duration, distance travelled, maximum speed and acceleration as the 2 horses were together and carried out the same training session. 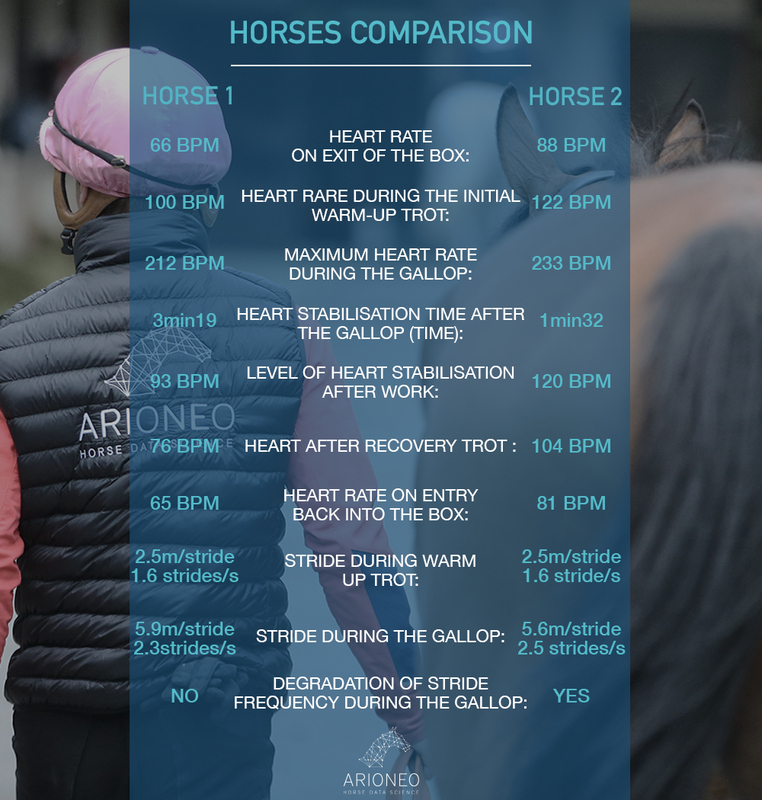 It is very obvious to see a big difference in the maximum heart rate, Horse 2 at 233 beats per minute and Horse 1 at 212 beats per minute. On the graph that represents the heart, we can see that there is an immediate difference between the 2 horses. Right out of the box, Horse 2 has a much higher heart rate (87 beats per minute) whereas Horse 1 (67 beats per minute). It would seem the younger horse is more excited to be out. During the warm up we can see the heart rate increase rapidly to 125, even 130 beats per minute while Horse 1 remains at 100 beats per minute. Comparing the 2 heart rates we can see that Horse ‘s heart rate is increasingly rapidly. During the gallop, we can see that once at 50 km per hour, Horse 2’s heart rate rises to 230 beats per minute, it is probably as the its maximum heart rate since it does not go beyond this rate. At the beginning of the deceleration, it retains the same heart rate unlike Horse 1 which is already decreasing at this point. At completion of the work, the young horse stabilises at a relatively high level, 119 beats per minute versus the 3 year old at 93 beats per minute. During the trot work during the recovery phase, the heart rate continues to be higher than Horse 1 and takes much longer to recover, coming to stabilise at around 100 beats per minute whilst Horse 1 is at 75 beats per minute. Even back at the stable, he has still not recovered completely as the heart continues to be at 90 beats per minute, however at this particular yard the horses go on the walker after their lot. If we look at the entire excerice as with Horse 1, at the 50 km per hours the horse is covering 5.5 metres with 2.5 strides per second. These types of parameters often indicate a horse suitable for short distances. If we remember, Horse 1 was covering 5.9 metres at 2.3 strides per second which highlights the fact that the two horses do not have the same way of going. Horse 2 is an excellent subject for looking at the interval table, and to have a detailed analysis over the 200 metres (furlong). Looking at the time and the average speed for Horse 2 over every 200 metres,m it appears that the instructions from the trainer were followed. The horse maintains the 50 km per hour through the gallop and you can see that the horse reaches 226 beats per minute when it reaches 50 km per hour. During the gallop, the heart rate reaches a maximum of 230 beats per minute, unlike Horse 1 which has never reached its upper limits. Looking at the interval times, we can look at, analyse and detect possible horse fatigue, the degradation of pace during the gallop. For example, in the first 200 meters segments, Horse 2 is increasing its pace. During the work phase he has regular 2.5 strider per second but as the gallop progresses we see that the horse degrades to 2.2 strides per second although maintaining the same speed. This degradation is a potential indicator of over-exertion or fatigue during exercise. By analysing this comparison, we can see that these two horses are not a the same level of physical capability and currently do not have the same physical skills. To follow-up the training, the ideal would be to carry out a carbon copy exercise to evaluate the changes in the data, particularly in Horse 2 who was struggling more, after a couple of weeks. This will enable the trainer to see how the horse is progressing with strength, speed, stamina and overall physical condition. The data evaluated here was for a specific case. For other areas we focus on other areas around speed, stride length and frequency and heart rate. This type of analysis provides a snap shot in time of a specific moment during a horse’s preparation. However, the real value comes over time where data is collected regularly. 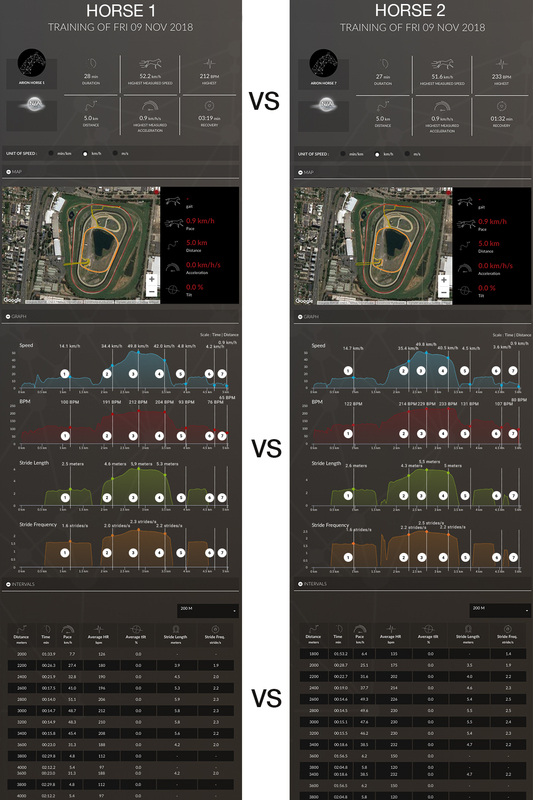 By collecting data over time this provides much greater insight into a horse’s physical condition and capabilities allowing a Trainer to individualise and refining the racing choices for each horse. With this data available it allos a Trainer to have objective data on the physical strengths of each horse, the progress and the ability to compare performance over time, particularly helpful in detecting future performers. How to understand movement activity with Orscana?